Living in America's Dairyland for more than six years now, I can attest that cheese (and attendant dairy products) truly is everywhere. I had never seen a cheese section so large as that at Woodman's (also the largest grocery store I'd ever been in) nor had I ever gone to a school where cheese was made on-site or where you could become certified as a master cheesemaker, or lived in a place where cheese curds are as ubiquitous as Coke and Pepsi. So it's really a wonder that took me so long to try to make some of my own. I've been on a DIY food kick of late--my boyfriend and I have been brewing beer, growing mushrooms (edible not hallucinogenic... at least that I know of), and growing herbs, among other things, in our rather small place. 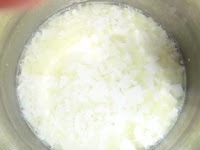 I decided to make feta, mostly because many of the other options, cheddar, colby, monteray jack, needed to age and wouldn't be ready until fall 2009--I'm not known for my patience. And despite lacking what appeared to be necessary equipment (who has a pot big enough for two gallons of milk that will then fit inside of another pot? 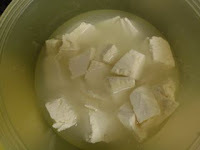 ), I did the best I could and produced, in 12 hours or so, a fairly passable feta. The instructions were a tad unclear at points--what exactly does "cut into convenient-sized blocks" mean?--but if it looks like feta and smells like... well, cheese, it must be okay. It might taste more feta-y if I had used goat's milk but cow is what I had so cow is what I used. Master cheesemaker, here I come. And I thought making bread was time consuming! Can I please try some of this?? ?